Face Nourishing Oil by Ayurvedic Skincare range Rasasara Skinfood. Suitable for sensitive skin and for balancing Pitta dosha. Helps to support skin against inflammation, rosacea, sunburn, oily T–zone or acne. 30ml. Buying this product = 54 Reward points for Members. Your cart will total 54 points = voucher of $2.70. Not a Member? Join at checkout to claim these points. 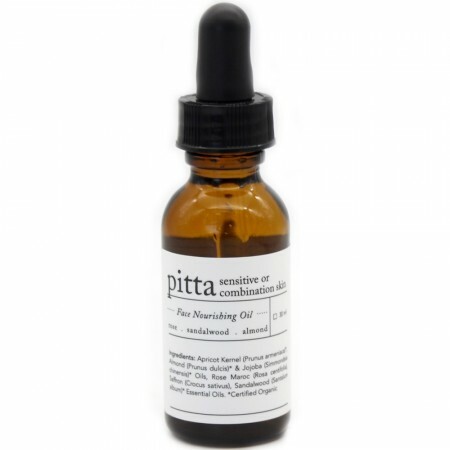 Nourishing facial oil for sensitive or combination skin. Apricot oil is naturally high in fatty acids and Vitamin E to soothe and repair the skin. Jojoba oil helps balance the skins sebum production. Suitable for balancing Pitta dosha. Infused with Rose, Saffron and Sandalwood essential oils.